I read those lines as a young Navy SEAL Ensign. They are from a classic by Dr. Scott Peck called The Road Less Traveled. I am sure many of you have read it, and appreciate the simple, yet profound message as I do. Dr. Peck was an Army medical office and later served as Assistant Chief of Psychiatry and Neurology in the office of the Surgeon General in Washington D.C. He knew all too well about how difficult life is and surmised that the mental toughness to deal with life’s inevitable challenges started with deep self-awareness. Peck teaches that self-discipline, self-discovery, and brutal self-honesty, are the foundations of sustainable personal and spiritual development – the type of development that leads to the success experienced internally as a peace of mind, rather than success found through external measures, which is always fleeting. I felt a kinship with Dr. Pecks words then and now appreciate even more how profound this simple truth is. Even today, as I kicked off an SEALFIT Special Ops Academy, I marveled at how few take the road of known hardship, where the challenge is accepted for the growth that will ensure. Those that go toward challenge experience growth physically, mentally, emotionally and spiritually. I felt so humbled that 14 warriors had traveled from as far away as Australia, to challenge themselves in the most severe way for their own growth. They are taking the road less traveled. I have personally found that the best things in life are often the most difficult things to consider. They include things that require the type of choice where you have to pause and take a deep “ok I got this,” breath. Those pivotal moments inevitably lead to the best decisions and outcomes. This was true when I left my career on Wall Street for the much riskier (and broker) career as a SEAL. It was also true when I chose to leave the SEALs for a woman I loved. It continues to be true to this day as I reinforce this idea that the road less traveled is always more gratifying, even if it is more challenging. So my question for you is: Where do you stand on this? Do you take the hard road, the one that requires discipline and sacrifice, or do you stick to the status quo? Find your Why: This sounds so simple but is yet elusive for most of humanity. Your “why” is a deeply felt sense of purpose, a purpose that can only be experienced by tapping into your Essential Nature. When you find your why your entire life becomes clear and focused. Live Warrior Disciplines: It is no surprise that warriors are disciplined. But where did this discipline come from? And how did they develop it? And, by the way, what exactly are they disciplined with? These are questions that don’t usually get asked. It is just assumed that this elusive discipline is just working hard day in and day out. While working hard is certainly a warrior discipline, it is but one of many. Others warrior disciplines include simplicity, humility, self-mastery, and service. These require patient practice every day, which is the real hard work! Develop Leadership Grit: Leadership is about authenticity and trust. Grit is about mental toughness and resiliency. When you combine authenticity, trust, mental toughness and resiliency you get transformational results. That transformation is experienced by both individuals and teams. Become Sheepdog Strong: Most people live like sheep…minding their own business and oblivious that the wolves who are watching, waiting to pounce. The only ones looking out for the sheep are the sheepdogs. Up until now the sheepdogs (police, first responders and military) were enough to protect them. But no longer. Now we must all step up to be the sheepdog for our families and communities. This can be trained. Take Massive Action: Too often we put our toe in the water, try things out, give it a go. But these lukewarm efforts usually fail, or at the least produce mediocre results. When the inevitable happens, we chalk it up to the fact that we weren’t really committed anyway, or it wasn’t meant to be. The whole point is you shouldn’t commit to ANYTHING unless you intend to dominate the mission and WIN! This requires massive commitment, massive focus, and massive action. Anything less is not a serious effort. Clearly it is not easy to live these five principles, just as it is not easy to take the road less traveled. These qualities are not something that just you are born with, nor can they be learned by reading a blog, or listening to a podcast. They must be transmitted through training, then practiced diligently. If you are interested in learning more about these five principles and reflecting upon what it means to take the road less traveled, I will be presenting them in my first online training of the year on June 16th. If you want to join me then CLICK HERE. I will be going deeper into what I am calling the 5-Part Formula For Peak Performance. 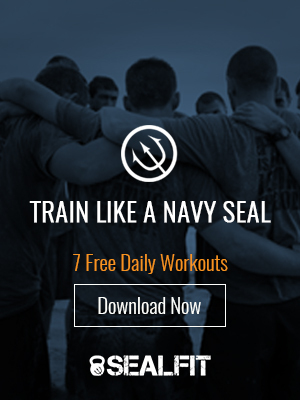 It is an evolution of the information that I teach at SEALFIT Academy, and incidentally, the same process I’ve used personally to achieve success with balance. I am committed to helping you achieve 20X potential, and find huge success while having balance across ALL areas of your life. So I truly hope to see you on the 16th!